This video walks you through common woodworking tasks and the best clamps to use for each application. 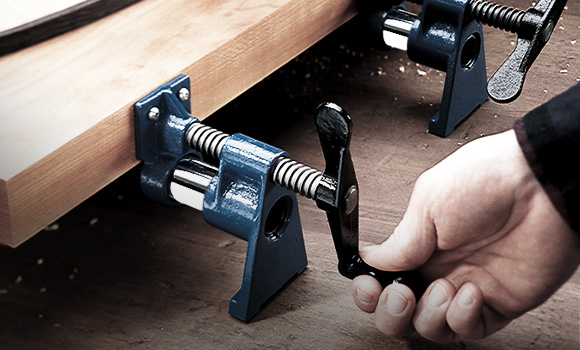 Pipe Clamps - Designed to fit a specific diameter (most commonly 3/4") of standard threaded pipe, these clamps are infinitely adjustable and great for edge-gluing boards. Parallel-Jaw Bar Clamps - Have jaws that are designed to remain parallel when the clamps are tightened. They are a popular choice when maintaining right angles is important. F-Style Clamps - Similar to C-clamps, but has a wider capacity allowing for them to be used on larger scale objects without the need for a large screw. Spring Clamps – Also known as a hand clamp, are best for quick fastening and gluing jobs requiring only light clamping pressure. Band Clamps - Include a ratcheting mechanism that makes them good for clamping round, odd-shaped or multi-sided assemblies, ranging from boxes to chairs. Toggle Clamps - Has a single clamping plate and is commonly used to hold workpieces in woodworking tasks, such as sawing and drilling. C-Clamps –These metal clamps tighten with a screw mechanism and provide a huge amount of pressure to a small area.